The lobby of Columbia Plaza was buzzing with well-dressed Cincinnatians as they awaited the shoot up to the 29th floor. A harp and a flute tinkled across the room as guests chatted and took pictures against an Instagram-appropriate plant wall. 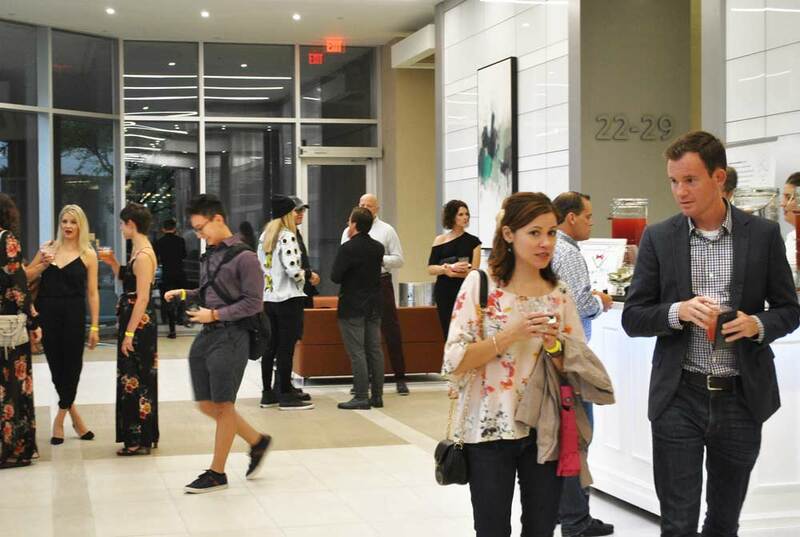 Columbia Plaza has been in the process of renovation since April 2017 and the lobby, now complete, is a roomy, brightly-lit, high-ceilinged space. Large windows line the walls on all sides — top and bottom. The night was dark and drizzly, and as I approached from the outside, the room looked like a bright little bubble of excitement. During the day, the space is sure to be flooded with natural light. One floor up from the lobby, there was a large lounge and kitchen area, yet to be finished. Models and stylists were buzzing about in the Columbia Plaza team office, which was sleek and modern. The space was full of heat and hairspray. After exploring upstairs, Tamia and I lingered in the lobby, feeling classy and waiting for the go-ahead to head to the 29th floor. Kelly Maglocci, the organizer of the event, explained that she wanted to build suspense and excitement for what was waiting for us upstairs. When we finally stepped out on the 29th floor the impact was real. Unlike the clean elegance of the lobby, the 29th floor was raw and industrial. Unfinished and warehouse-y. The juxtaposition only added to the excitement. Around the space were graffitied posters of famed musicians — Michael Jackson, The Rolling Stones, The Beatles — and a dry-erase wall where guests could do some graffiti themselves, adding to the rogue-artist aesthetic. The runway was formed by light fixtures that looked like they had fallen from the ceiling. Between the seats, there was a VIP lounge area, designed by our very own Yvonne Ballard, who recently helped us out with designing a set for The Women's Fund. A comfy couch, futuristic coffee table, and bar cart of champagne provided a modern luxury experience within the industrial space. We took our seats, and Kelly announced the seven featured designers: Calle Evans, FRWHLR, Grind and Glaze, Jonathan Mezibov, Loner, Livlocal, and Philippe Haas. Floating above Cincinnati, eye-to-eye with the top of the Fifth Third Center and the Carew Tower, models began coming down the runway. Design by Grind and Glaze. The show itself was as raw and unexpected as the space. Accompanying the first collection was a live singer. The execution of each collection was unique in that it seemed to reflect the personalities of the clothing. While Grind and Glaze’s fluid, minimalist clothing was modeled by slow, methodical, 360-degree turns, LivLocal’s athleisure streetwear bounced down the runway as the models skipped and strutted. As the designers came out at the end, it was cool to see how each collection clearly matched their makers. The Grind and Glaze collection. After the show, I asked some guests about their experience at the event. Most guests were attending in support of a friend or family member that was modeling, or that had helped organize the event. Everyone I spoke to expressed how they were pleasantly surprised by Cincy’s fashion scene — surprised that Cincy even had a fashion scene. One guest mentioned that she totally saw the event as a reflection of Cincinnati’s growth and revitalization. I think her words sum it up pretty well. The Pinnacle Fashion Show goes hand-in-hand with the creative awakening that Cincinnati has seen over the past few years. We had been admitted to the cool, underground world that is Cincy’s fashion scene, a feeling amplified by the Columbia Plaza space. The event gave these designers, models, musicians, and even guests, an outlet to express themselves, and one that was right in their hometown. Sounds a lot like our Tether philosophy, huh?